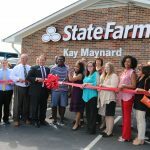 Kay Maynard State Farm Ribbon Cutting Ceremony is a HIT! 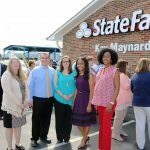 We were honored to be a part of the Ribbon Cutting Ceremony for Kay Maynard State Farm in Lebanon, Tenn. 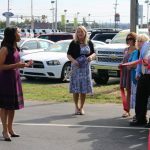 The ceremony was well attended with Lebanon Mayor Philip Craighead, members of the Wilson County Chamber of Commerce, State Farm representatives, and members of the Lebanon and Wilson County business community present. 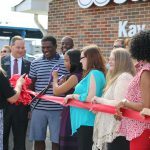 The event opened with a words from Kay and Wilson County Chamber representatives. Attendees gathered afterwards, chatting and touring the new office. 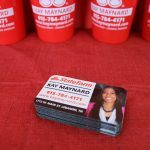 We want to extend a special thank you to Kay Maynard for allowing us to experience this special day with her. 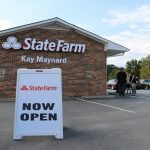 Don’t forget to attend the Grand Opening Ceremony from 11 a.m. to 2 p.m. on this Saturday, October 8 at the Kay Maynard State Farm Office, located at 1712 W. Main Street. Attendees will experience food, fun, music, face-painting, games, and a free ice cone from the Snow White Diner.